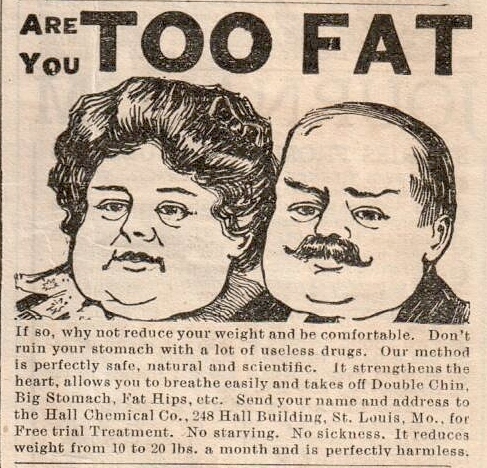 The Atomic Eye: Are You Too Fat? Are you too fat? If so, why not reduce your weight and be comfortable. Don't ruin your stomach with a lot of useless drugs. Our method is perfectly safe, natural and scientific. It strengthens the heart, allows you to breathe easily and takes off Double Chin, Big Stomach, Fat Hips, etc. Send your name and address to the Hall Chemical Co., 248 Hall Building, St. Louis, Mo., for Free trial Treatment. No starving. No sickness. It reduces weight from 10 to 20 lbs. a month and is perfectly harmless.